You can readily find numerous news reports and blog posts about it. There are also the findings of fact from the case (R v Stephan, 2016 ABQB 319 (CanLII)). The short version is that Ezekiel fell ill on February 27, 2012. Despite worrying symptoms like difficulty breathing, his parents did not take him to a medical professional for examination. Instead, they called a nurse friend and discussed his symptoms over the phone, deciding it was just croup. They gave him water and maple syrup using an eye dropper to increase his fluid intake, along with various supplements. He continued to have difficulty breathing for nearly a week, and then his symptoms started growing worse. They gave him "apple cider vinegar, onion powder, ginger root, garlic, hot peppers, and horseradish root", but over the next couple of days he started to develop stiffness to the point that his back started to arch. They did not take Ezekiel to a doctor. They called their nurse friend, who came to their house to examine Ezekiel. She wasn't sure of the issue, but suspected it might be meningitis. She recommended they take Ezekiel to a doctor. Ms. Stephan looked up meningitis on the internet and decided to play-act being a doctor, deciding, in her complete lack of medical training, that Ezekiel must have viral meningitis (note that online medical sources generally recommend calling a doctor if meningitis is suspected). David and Collet decided to treat him with more supplements. They did not take Ezekiel to a doctor. On March 13, two weeks after first falling ill, the Stephans drove into Lethbridge to sign some purchase documents, taking Ezekiel with them. He was too stiff to sit comfortably in his car seat, so they made up a bed for him in the back of their SUV. They called a naturopath for recommendations to boost Ezekiel's immune system. The receptionist told them to take him to a doctor, but they said they had a nurse friend looking in on him. They dealt with their lawyer, stopped by the naturopath's office to buy a "natural remedy", and then went shopping at Superstore. Superstore has a walk-in clinic attached to it, but they didn't take Ezekiel in. Instead, they headed home with Ezekiel once again lying in the back of the SUV, too stiff to sit in his car seat. They still did not take Ezekiel to a doctor. Mr. Stephan noticed that Ezekiel began to experience irregular breathing, and shortly after Ms. Stephan returned from her meeting, around 9 pm, Ezekiel stopped breathing. 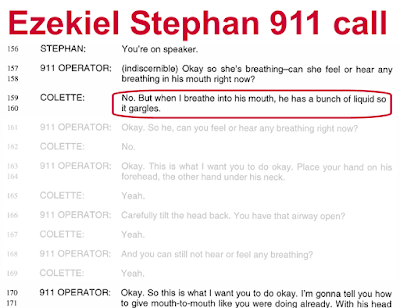 Mr. Stephan called his father, and then called 911. Ms. Stephan patted Ezekiel’s back and he started breathing but stopped again shortly after. Ms. Stephan gave Ezekiel a few rescue breaths and he started breathing again. 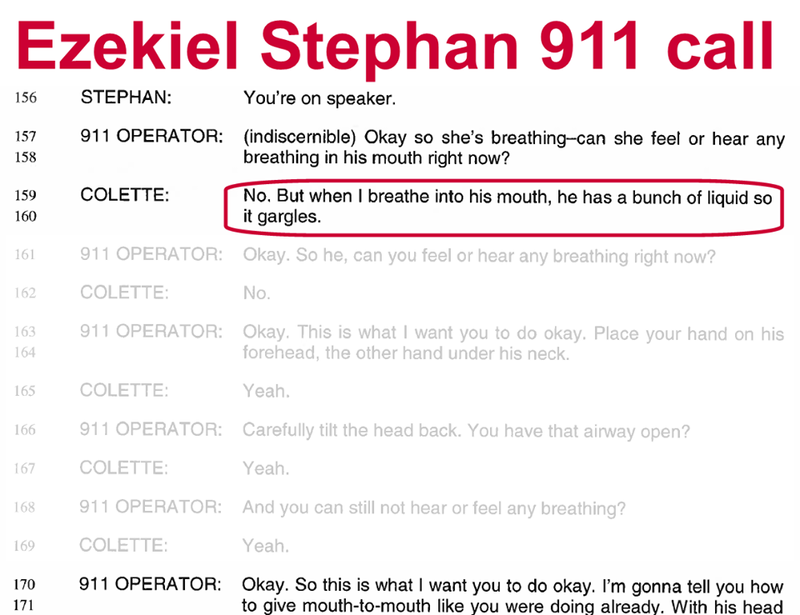 Mr. Stephan told the 911 operator that an ambulance did not need to be dispatched because Ezekiel was breathing again and they would drive him to the hospital. About 20 minutes later the family left in their vehicle for the Cardston hospital. Ezekiel stopped breathing again and Ms. Stephen performed CPR in the vehicle for a considerable time while Mr. Stephan drove and called 911. The family met the ambulance a few kilometers from Cardston where the ambulance attendants took over Ezekiel’s care. By then Ezekiel was blue. When the emergency responders took over Ezekiel’s care he had no pulse or blood pressure, his heart rate was 0, he was not breathing, his respiratory rate was 0, and his Glasgow Coma Scale (GCS) score was 3, the lowest score possible. The GCS gives an indication of the level of consciousness. He had no eye opening, muscle movement or verbal response. The doctors described this state as being dead. Despite Ezekiel's signs indicating that he was dead by the time the emergency responders arrived, they did not give up on him. They took over CPR and tried to establish an airway, but were unable to for about 8 minutes. Once they reached the hospital, they saw Ezekiel's chest rise and fall. Doctors took over, continuing CPR and giving him intravenous medications and fluids. After about 30 minutes, his heart started beating again. 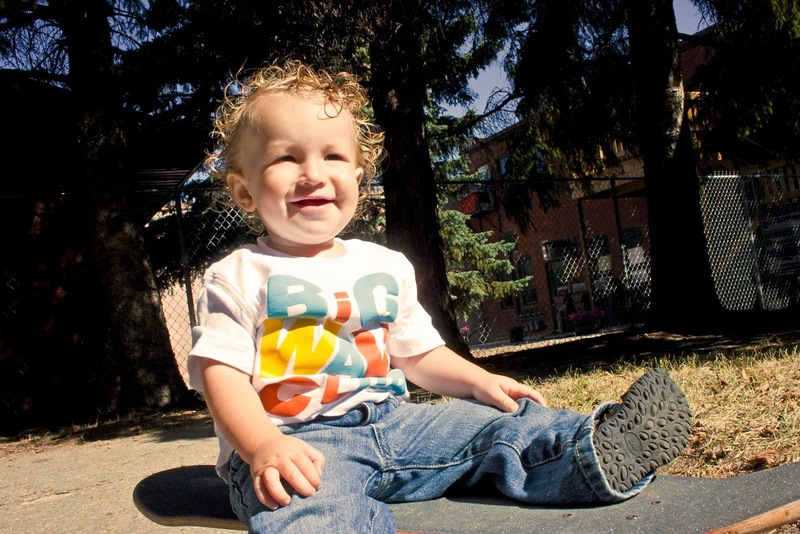 He was ultimately transported to the pediatric intensive care unit at the Alberta Children's Hospital in Calgary. He did not regain consciousness. 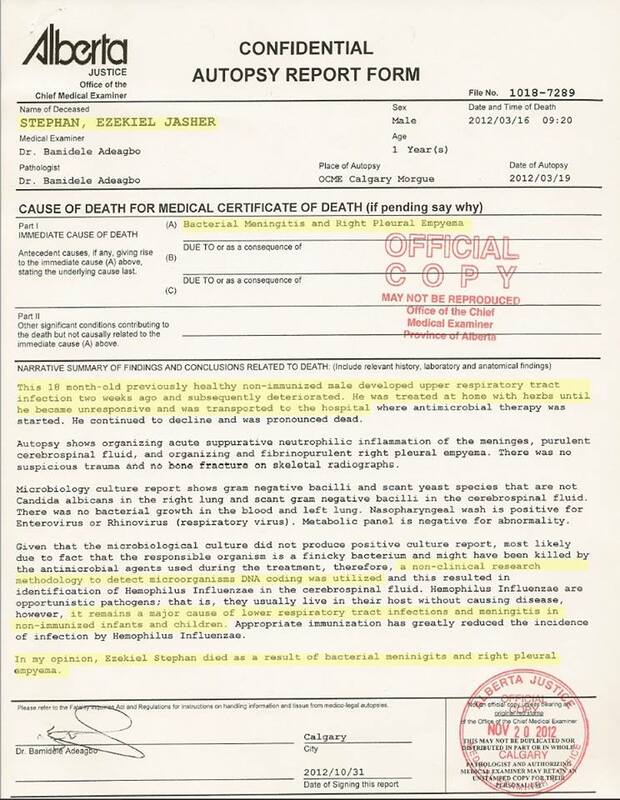 Two different neurologists examined him on the mornings of March 15 and 16, both determining that he was brain dead. David and Collet Stephan kept him on life support for two more days despite Ezekiel's continued lack of neurological function. David Robert Stephan and Collet Dawn Stephan were found guilty of failing to provide the necessaries of life on April 26, 2016. Not once since their son died have the Stephans acknowledged that they did anything wrong. Instead, they blame the emergency responders for not having the appropriately sized tube to intubate Ezekiel. Note the faded portions where Collet says he was not breathing. Haemophilus influenzae type b can be prevented by immunization, but it is unclear from the autopsy report which serotype of Haemophilus influenzae Ezekiel had. Yet this case is not about whether Mr. and Mrs. Stephan were negligent in not vaccinating their son. Rather, the case is about their not seeking appropriate medical attention to treat Ezekiel's illness, which ultimately killed him. There were multiple points when his parents ought to have recognized that he needed proper professional medical care. The vaccine issue is a distraction from the fact that, whether or not David and Collet thought they were doing the right thing, their actions (or rather, inaction) killed their son. The primary concern appears to be with what this case has meant for David and Collet and other parents who choose to eschew proper medical attention for their sick children, rather than concern for the children themselves. Reasonable people, like the jury who convicted the Stephans, recognize that what they did is reprehensible. Reasonable people focus on the kids. The Stephans, Polly Tommey, Del Bigtree, and the like seem to care more for the parents that neglect and abuse their children. This is an attitude that is, sadly, quite common among those who opt for so-callled "alternative medicine". Children have rights. They are not the property of their parents. While parents have the right to make medical decisions for their children, those rights are not absolute. What is truly disturbing is how the anti-vaccine community tends to rally behind parents that harm their own children. Anti-vaccine groups like the National Vaccine Information Center and the Australian Vaccination-Skeptics Network try to excuse child abusers by claiming that shaken baby syndrome is actually vaccine injury, and that the abusers were wrongfully accused. They sympathize with and excuse parents who kill their autistic children. And when a child artfully takes down the anti-vaccine movement, they respond by trying to intimidate and dox him (try being the operative word). For all that the anti-vaccine movement claims to be about the kids, they really only care for themselves, for their ideology. Will any of them have the courage to stand up and denounce those who harm their children? As an additional resource, there is a blog that has put up transcripts of the police interviews with David and Collet. The interviews were originally released by CBC News. Note that despite what Mr. Stephan claims in the interview with Polly Tommey and Del Bigtree, Mrs. Stephan admits that Ezekiel was too stiff to sit in his car seat. The interviews also reveal that his symptoms ought to have raised concern and cued his parents to take him to a doctor. 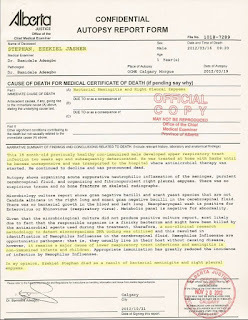 Why was an x-ray taken on entry of the hospital that disproves one of the stated causes of death withheld from use as evidence in the trial? Why was an unproven testing method used to diagnose bacterial meningitis? Why was the ambulance that met Ezekiel's parents on the way to the hospital only stocked with appropriate equipment a week after Ezekiel's death? Why the unscientific assumption that Ezekiel would be alive today if the parents had sought pharma-corporate approved sources of medical care earlier? It seems to me that these parents did more for their child than most parents and their personal experience and research took them away from the field that is at least the third leading cause of death in the U.S. And when the all adverse effects of mandatory vaccination finally come to light...where will they rank in the minds of the public then? Oh why, oh why, oh why did they not call Miracle Max and get a resurrection pill? The real question is why these parents did not get real medical help before their child essentially died? You're that guy, aren't you, J? Everyone going on and on about "the third leading cause of death in the US" seems to think that all those people who died would not have died if they had not gone to the hospital. That's wrong. They were sick to begin with. It's not like they just wandered into the hospital by accident and then the errors happened. They will be considered child killers now and for ever after. Those that support them with lies, red herrings and ignorance will be know as people that support the murdering of children. Those supporters will also be conspiracy nuts...and morons. well, it appears that by the time the ambulance arrived, the poor boy was dead. To neglect significant warning signs and recommendations take a sick child to a doctor until he is virtually dead and then complaining about the useless medical personnel is horrendously deluded. Unfortunately, this isn't rare among vaccine refusers - I followed a similar case with a boy who had tetanus (he did survive, luckily) and the last German diphtheria case (a 3 year old girl, who died) was equally bad. As my mom used to say "modern medicine can cure virtually anything, you just have to give them a chance". I guess the bottom of the barrel isn't deep enough for parasites like Wakefield, Tommey and Bigtree to scrape that they have to add the Stephans as poor put upon persecuted health freedom fighters. All of these people are disgusting excuses for humans. "When two people become parents, they take on a responsibility to care for and do what is best for their children"
If the action that results in the birth of a child obligates you to care for it, why can you stop caring for it when it is in your womb by having an abortion? Classy, Schecter, very classy. And very very stupid.